Milan may be considered one of the main centers of Italian research, at least in its international and cooperative dimension, as it is demonstrated by the data regarding the Seventh Framework Programme (FP7) that Scienceonthenet have analyzed(1). From such data, the great research centers of Milan clearly stands out, especially in the fields of biomedicine, energy and information technology, but there are also hundreds of small enterprises that collaborate with partners from abroad, in a “Europe of knowledge” that is still to be fully discovered. In this article, which represents a first draft of Scienceonthenet’s database Italian Research Map (IRM), we tried to verify with data analysis the international perspective of the research carried out in Milan(2). In order to do this, we filtered all the projects within the FP7 of the European Commission (2007-2013) that had at least one Italian partner. From this set (made up of approximately 5000 projects out of 20000) we selected all the projects that involved at least one partner from Milan at September 2013, for a total of 1061 projects. The result is a map of the Milan-based international scientific research, which includes 240 centers, from the main universities of the city to the National Council of Resarch (CNR), from several research institutions to small enterprises that participated in one or more projects from the FP7 (see table 1). At a first glance, it is possible to identify the high Milanese specialization in some fields such as health, energy and information technology, where institutions from Milan participate in one quarter to one third of the total projects with at least one Italian partner. These data are still preliminary and were obtained from data supplied by the European Commission. In this first release we focused the resolution at the level of universities and research centers, without further considering the different departments (the only exception being the CNR, see table 3). Also, we did not consider the economic aspect of the projects, neither we normalized the number of projects that each university/research center obtained for the number of researchers or other similar parameters. These will be the next steps of the IRM Project that Scienceonthenet will achieve in 2014, in order to obtain a detailed and precise picture of the protagonists of Italian research in Europe. The necessity of a more transnastional profile that Italian research should acquire has been rightly stressed out: for this reason Europe promoted the ERA (European Research Area) strategy, which, through the FP7 and the recent Horizon 2020 funding programme, aims to increase efficacy and innovation of research in the continent with a real collaboration between the 28 countries of the Union(3). However, the degree of internationalization of national research is still low, both financially (7 percent of funds to different countries comes from European projects, while this amount should rise to 10 percent with Horizon 2020) and when collaborative networks are concerned, most of which are within the national borders(4) (5) (6). Going back to our dataset, in order to test the international level of scientific research carried out in Milan we cut the data at the level of the first ten institutions, classified on the basis of the number of projects, and we had some surprises: for instance, the fourth position gained by the Centro Studi Fiat. A very positive result was also obtained by the CNR, who classified first in spite of the not brilliant evaluation from ANVUR. Another relevant result is the presence, within the first ten positions, of the Politecnico and the Università degli Studi of Milan, respectively third and tenth. It is also interesting to analyze the Milanese contractors involved in at least 10 projects. In this rank, the main universities stand out together with the CNR and some other major player like Istituto Mario Negri, Fondazione San Raffaele, Telecom, RSE, Humanitas, Fondazione Mattei and many others. A mark of quality is represented by the fact that, whilst Milanese contractors constitutes about the 10 percent of the total Italian amount, the number of projects that see a Milanese institutions as a participant is more than 20 percent and the average number of projects for Milanese contractors is 4.38 versus 2.40 for the others. Obviously, rankings change and become more informative when some of the 22 topics that were part of the FP7 are analyzed further: this allow to draw a more articular map of the contractors on the basis of health, energy, environment, information technology, nuclear energy, ideas, nanotechnology, people, infrastructure, KBBE, Jti, regions, space (see table 4). Finally, our analysis allows to observe the network of national and international collaborations that involve Milanese research institutions, together with the cooperative subnets for each topic. 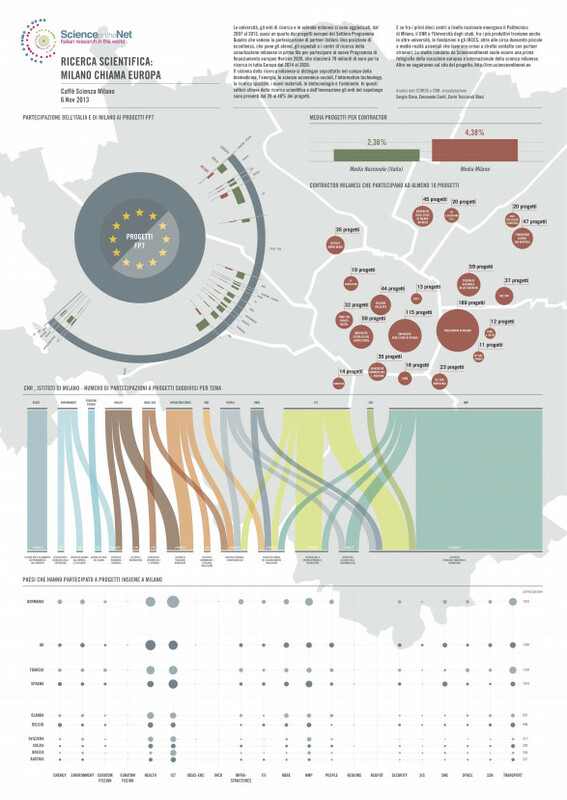 A real quantitative and qualitative map of “Europe of knowledge” thus emerges, where Milan represents a key hub of the continental scientific network. Mapping the Italian research in its relationship with the rest of Europe is the aim of the Scienceonthenet project IRM that we briefly described here in its first results regarding the Milanese situation. Next steps will consist in a further increase of the resolution of our study, in order to include the level of the individual institute/department, obtain time trends, normalize data for parameters that allow detailed performance evaluations of each contractor, report European collaborative networks within proper maps and infographics to facilitate their interpretation. The final aim of the IRM project is, on the one hand, to become a thermometer of the internationalization level of Italian research, thus allowing to develop enforcing strategies based on a solid knowledge of actual situation, and on the other hand a valuable set of guidelines that may help to find the “right partner” for Italian and foreigner research institutions. We wish to thank the European Commission, CORDIS and the Office for Activities and Relationships with European Institutions of the CNR for data about Milanese CNR. (1) We considered the contractors located in: Assago, Bernareggio, Biassono, Bresso, Cernusco sul Naviglio, Cinisello Balsamo, Cormano, Corsico, Lainate, Milano, Opera, Rozzano, San Donato Milanese, Segrate, Settimo Milanese.